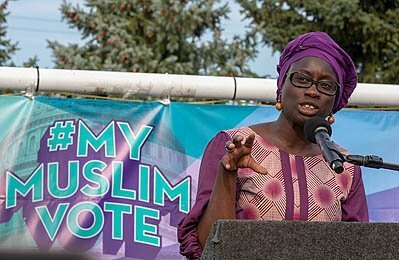 Dearborn, Michigan USA - 29 July 2018 - Fatou-Seydi Sarr speaks at a Muslim Get Out the Vote rally, sponsored by several Muslim community organizations. Sarr, an immigrant from Senegal, is a candidate for the Michigan State House of Representatives. Image Description: Dearborn, Michigan USA - 29 July 2018 - Fatou-Seydi Sarr speaks at a Muslim Get Out the Vote rally, sponsored by several Muslim community organizations. Sarr, an immigrant from Senegal, is a candidate for the Michigan State House of Representatives.